Decorative Farm Themed Light Switch Plates are a perfect way to add to your room décor. 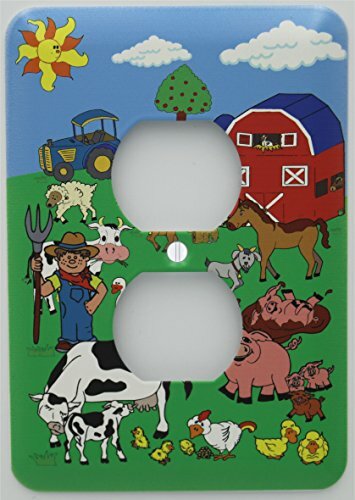 Presto Changos easy to use Farm Light Switch Plate covers with brightly colored Barn Animals and Farm Scene . Our Animal Farm Outlet Switch Plate Covers are a fabric / canvas wrapped for a designer look that is sure to compliment any Nursery or Children's Wall Décor. Farm Animal Outlet Switch Plate Cover / Original art by Presto Chango Decor. Manufacturer: Presto Chango Decor Inc. Publisher: Presto Chango Decor Inc. Studio: Presto Chango Decor Inc. If you have any questions about this product by Presto Wall Decals, contact us by completing and submitting the form below. If you are looking for a specif part number, please include it with your message.